10:01 – Here we go! Time to kick off this panel – here come the panelists Mike Anderson, David Silverman, Al Jean and Matt Groening of course! 10:02 – So first thing’s first – er, what’s coming up? Well Mike tells us the animation for the crossover with Futurama is “awesome” and “really hot”. 10:02 – Matt tells us there will be “a little Ralph Wiggum” this season… but we’re getting clips now!10:05 – We got an amazing trailer for FXX’s marathon of every episode ever (it was an apocalyptic wasteland while everyone watched), a sneak at the opening to the Futurama crossover – with Homer singing to the theme tune! 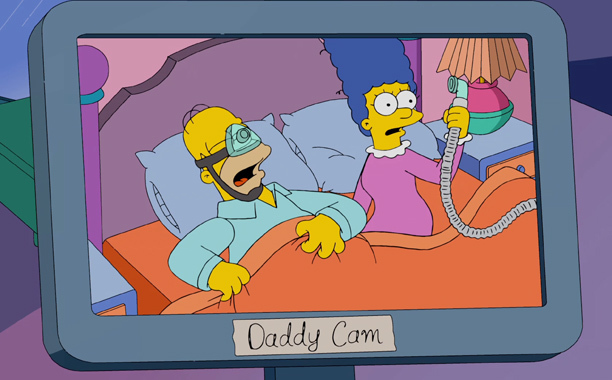 – and a clip of Lisa worrying about Homer’s health as he struggles with a sleep mask. Don’t worry – he’s not going to be the one that dies! We’ve been promised! That video can be found here. 10:06 – Mike tells us The Simpsons will age – but only by one day! 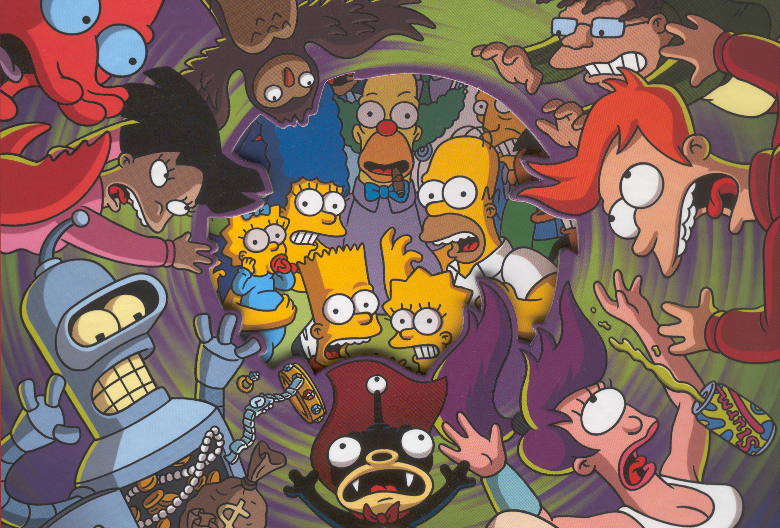 10:06 – We’re on to fan questions – this viewer wants to know about the timing of Treehouse of Horror. It’s normally pre-empted by the World Series, but it’s going to be on October 19 this year – before Halloween! 10:07 – Al jokes that as well as the Family Guy and Futurama crossovers and the death episode – we’ll get a Scooby Doo crossover! “One of those isn’t true,” he jokes. 10:08 – Is there any way to inject fresh blood into the series? “No!” we’re told. But Matt explains that no-one ever leaves the show once they’ve joined the series. 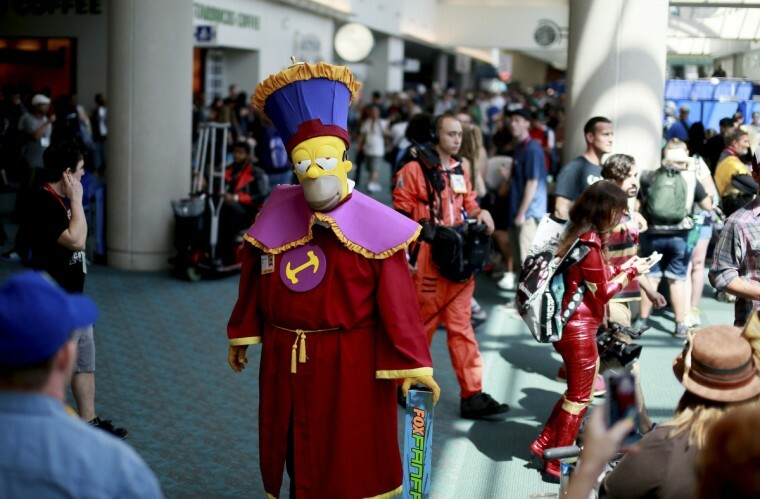 10:11 – The next question is coming from Homer in a Stonecutters outfit! He wants to know how Peter and Homer are going to interact in the Family Guy crossover. Al says there’s a “huge chicken fight” – he says the episode is “terrific” and Matt describes it as “really fun”. 10:13 – The next fan is excited about the Futurama crossover – could Futurama be resurrected? Al says there are two things that never die – science fiction and animation! But Matt says there are no plans to bring it back – though some people who work on the show are going to talk about it over waffles tomorrow morning… Lots of claps at that!10:14 – Matt jokes that Futurama had more final episodes than any other show! He says he was really proud of the series finale – but everyone loved working on it and would like to work together again. 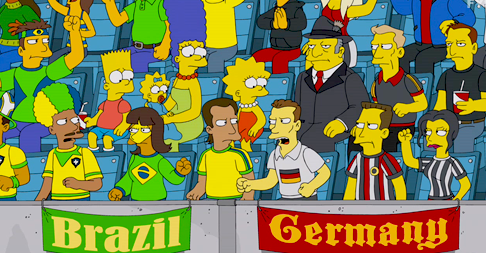 “If there’s a network who wants me, let me know,” he adds.10:15 – A Brazilian fan is annoyed that The Simpsons predicted some of the World Cup results! “It was all a coincidence,” Al promises, hiding the fact that the Simpsons crew have SECRET PSYCHIC POWERS. 10:16 – The next fan up asks for the panel’s biggest failure that turned into the biggest success. 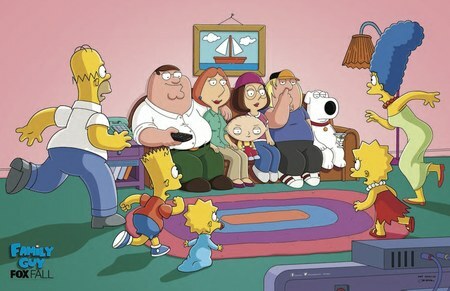 “The Simpsons,” Matt deadpans. Really, the first episode they got back from animation was a “disaster” – he says he thought if Fox saw it, they would be axed immediately. He jokes they learned how to make the show just in time! 10:21 – So, um, how did Matt come up with The Simpsons? He jokes that he’s going to make up an answer because he’s said this so many times! But really, he says that the older he got, the more cartoons died down in primetime – the only one before The Simpsons was Garfield and he thought he could do better than that. “If I have any lesson today, it’s watch more TV,” he concludes – to cheers! 10:29 – We just got to see A Clockwork Yellow from Treehouse of Horror! It’s just as silly as you would hope – really good fun with plenty of Stanley Kubrick references. 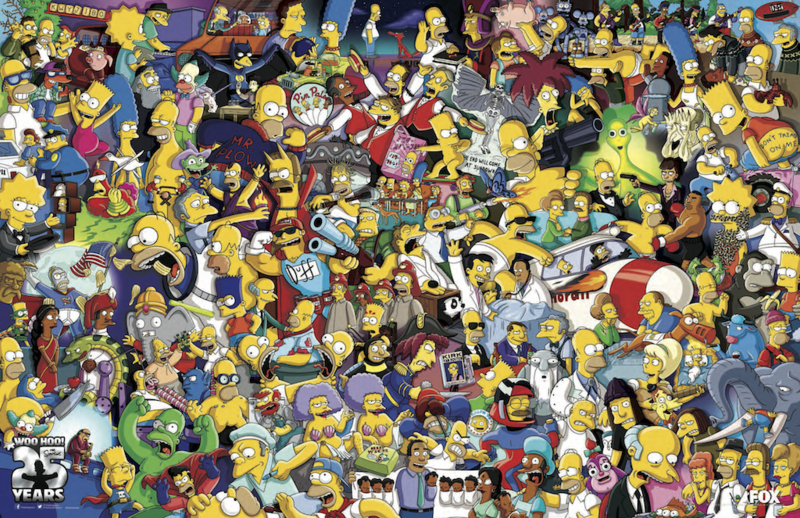 10:29 – The next young fan asks if The Simpsons is ever going to end? There are claps as Matt says the show is “going to be around for a while”. “We’ve got two years to run it into the ground and ten years before it ends,” he jokes. 10:37 – Sorry Bartman fans – no plans to see him in this season. 10:37 – There are a couple of things Spider-Pig is going to be in apparently – including singing the Spider-Pig theme tune at the Hollywood Bowl! 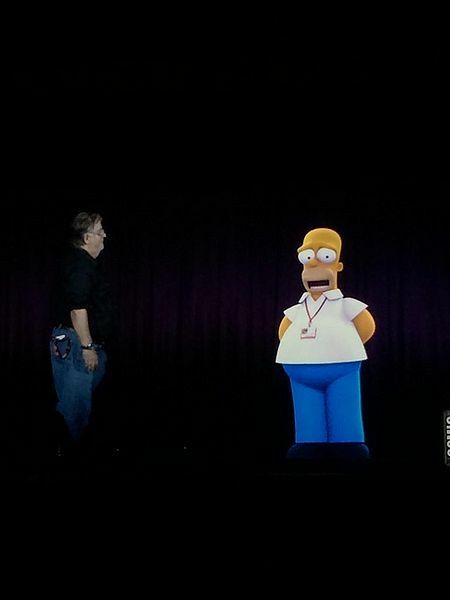 10:42 – “Enjoy the show and remember – as soon as it’s over, you should probably get in line for next year,” Homer tells us before heading off stage. That was really good fun! But that’s a wrap for this panel – thanks for joining us! And there we have it! 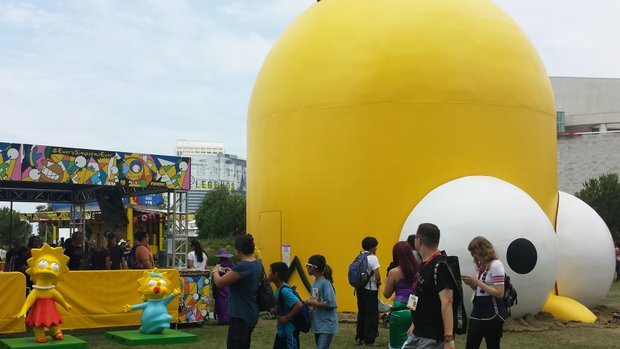 The Simpsons Comic Con 2014, if you want to see more extras from The Simpsons Comic Con 2014 check out Digital Spy’s post which can be found here. I’m sure there is more to come and there will be more information about The Simpsons: Season 26 coming up shortly in a post. Until then, Happy Tapping, Nathan.